A good tan will probably always remain stylish. People spend a lot of time, energy and money to get that beautiful, deep-bronzed skin color. From a natural suntan to sunless spray tans, there are a number of ways to get that perfect bronze luster. But are these methods safe? Sunbathing and tanning beds may seem like efficient options, but these methods will likely end up harming your skin. Ultraviolet (UV) rays are capable of causing irreversible skin damage like dark spots, wrinkles and other signs of premature aging, and even skin cancer. Sunless tanning products have a long list of drawbacks as well. Most contain harmful chemicals and have a terrible smell. Artificial tanning creams may leave behind an unpleasant orange undertone. So, if you are looking for a safe and inexpensive way to get a gorgeous tanned body, we’ve got you covered. A few simple ingredients are all you need to make your very own tanning lotions at home. Besides being safe and pocket-friendly, these homemade tanning lotions have several other advantages. Most importantly, they pose little risk for allergic reactions or other side effects, as you’ll know exactly what ingredients are being used. Also, you may adjust the recipe to get the desired shade. You can prepare a batch to last for a month by increasing the quantity of ingredients proportionately or make it fresh every time to achieve the perfect tan. You don’t have to wait for summer to get a tan, or spend your money on chemical-based tanning products. Here are two basic recipes for natural homemade tanning lotions. Unscented white lotion in the homemade tanning lotion recipes is recommended. That will make it easier for you to keep checking the color of the mixture until you reach the desired shade. Also, a scented lotion may not mix well with the fragrance of cocoa or the tea used. Use a lotion with moisturizing and hydrating effects that will keep your skin soft and supple. Cocoa will give you the shade of tan you desire while it heals and protects your skin. 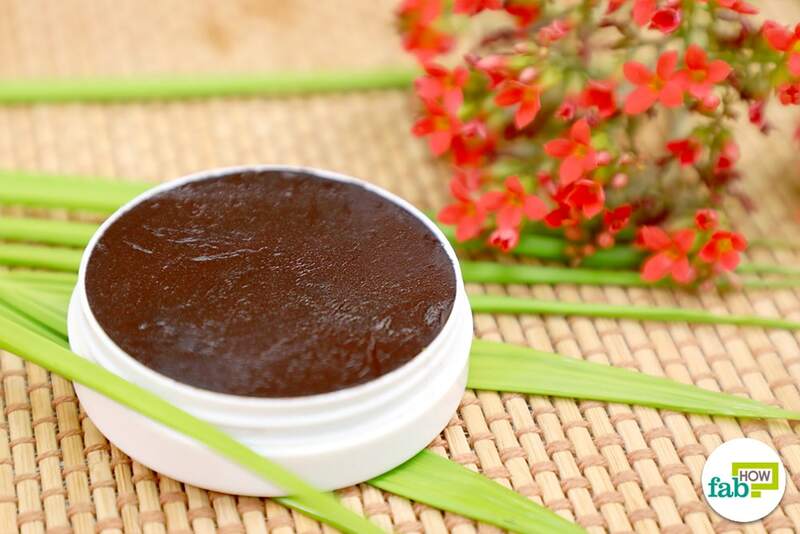 Pure cocoa plays a role in keeping the skin hydrated and youthful and offers a number of health and beauty benefits. It helps to block harmful free radicals in the body and protects the skin against sun damage and other signs of premature aging. Cocoa contains several essential nutrients, rich in antioxidants and has anti-inflammatory properties. The vitamin C and magnesium in pure cocoa helps to keep the skin healthy, while the omega-6 fatty acids aid in cellular healing. 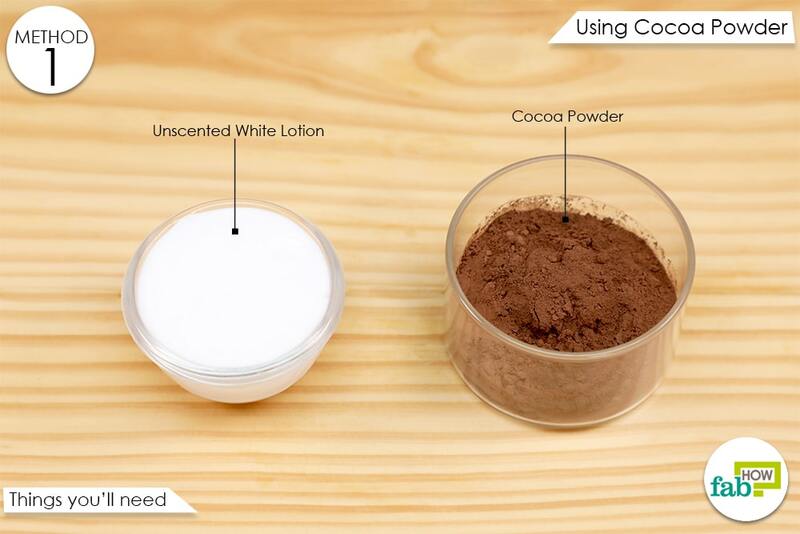 Cocoa also comes with great absorbent properties and can help prevent the damage caused by harmful UV rays. 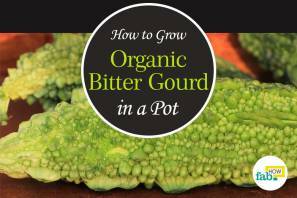 It helps to improve the blood flow to the skin to keep it nourished and glowing from within. Combine 2 ½ tablespoons of cocoa powder and 2 tablespoons of lotion in a bowl. Mix the ingredients well. Make sure the mixture is free of clumps. Apply the lotion evenly over the areas you want to tan. Apply another coat if you want a darker shade. You now have a perfect tan until the next time you shower! Making your tanning lotion was never this easy! You may increase the quantity of the cocoa powder to get the desired color. 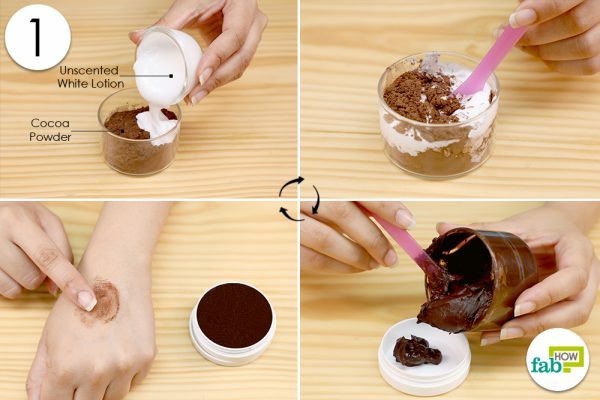 Note: The mixture will appear darker in the container than on your skin. There is a lot more that black tea can do other than helping you kick-start your day. Black tea has medicinal properties and several useful nutrients that are great for your skin and hair. 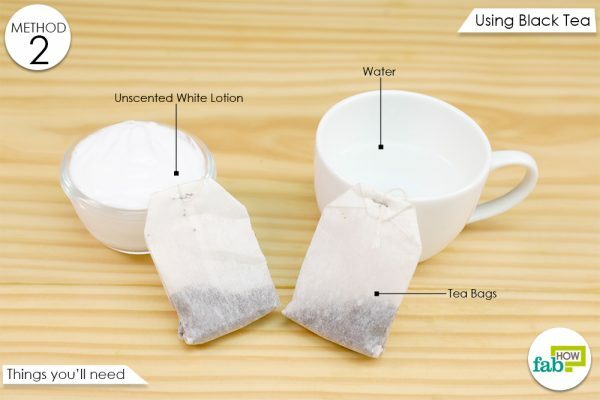 It is also rich in antioxidants and vitamins C and E.
Tea bags can be used for toning and be moisturizing the skin, treating puffy eyes, reducing dark circles and fighting signs of aging. It also helps soothe and heal the skin, especially after shaving. Tea acts as a natural dye and will help you get that perfect tan, minus any adverse effects. It will also protect your skin against harmful free radicals. 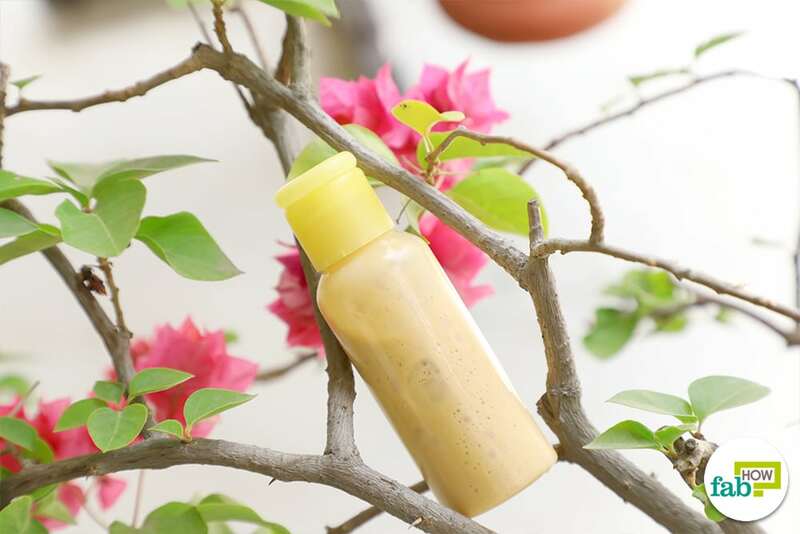 For best results use black tea to prepare this homemade tanning lotion. Soak the tea bags in ½ cup of water. 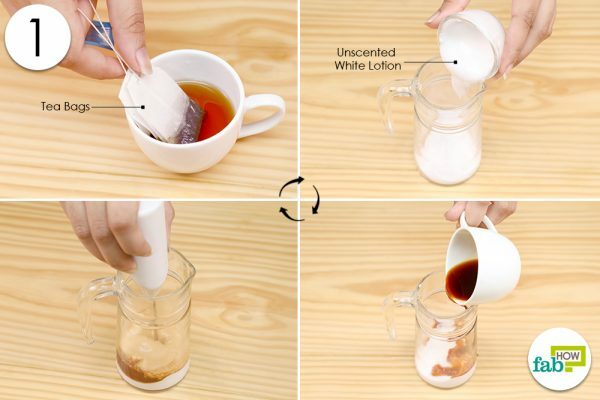 Put 2 tablespoons of lotion and the cup of tea in a jar. Use a hand blender to mix the ingredients. Pour the homemade tanning lotion into a container for storage. Apply the lotion evenly over the desired areas. Use another coat if you want a darker shade. Use the lotion daily until you get the desired results. Adjust the ingredients according to your preference. For a darker shade, reduce the quantity of water to brew the tea and follow the same steps as mentioned above. Alternatively, you can also increase the number of tea bags used. You may also use coffee instead of tea (although the benefits and results will vary considerably). For best results, exfoliate your skin before applying the tanning lotion. Fully sterilize all utensils and containers keeping them free of any residues or other contaminants. Always test solutions on a small area before first complete application, and be advised, different areas of skin may have different sensitivities. 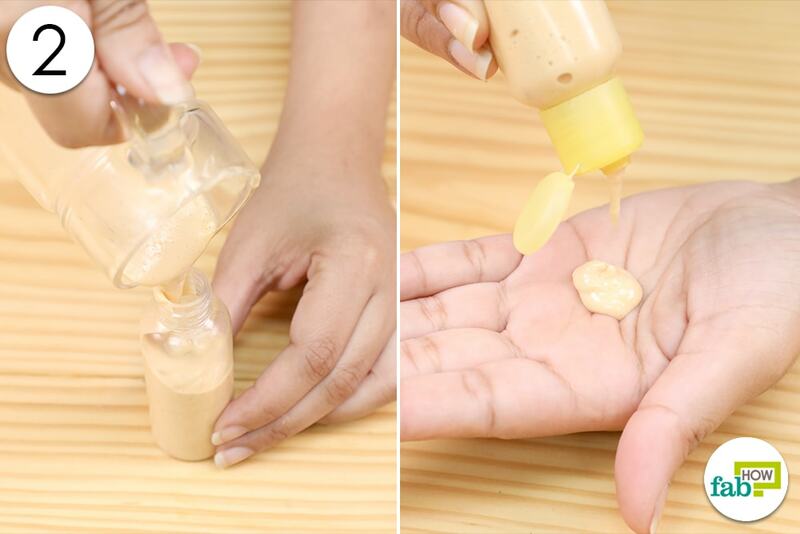 After applying the lotion, wait about 5 minutes and let it dry before getting dressed or applying the second coat. The results offered by homemade tanning lotions are not as strong as commercial sunless tanning creams or lotions. But they do not pose the same risks or adverse effects on your skin. Homemade tanning remedies are temporary. So if you want to keep your beautiful tanned look for a while, you will need to keep applying the lotion daily. If you are not a fan of tanning and looking for the opposite of tanning lotion, we have that covered too. Here are some easy ways to get rid of a suntan.